A large number of medical cyclotrons of various types and makes are now in operation in India and their number is ever increasing. A careful analysis of the various safety issues particularly in case of possible accidental conditions is required for a realistic evaluation of their impact. Apart from the external dose involved, internal dose issues under normal operation and in case of abnormal operational conditions such as target rupture, accidents, spills, etc., which are generally neglected also need evaluation. There is a need for carrying out worst scenario analysis and the possible dose consequences to the operating staff as well as the public due to releases through the stack. The paper carries out an analysis for a typical release of activity into the vault environment and the dose implications. Along with any measured air activity measurements in the vault of operating cyclotrons this would resolve the issue one way or other. During radio pharmaceutical processing a substantial fraction of the volatile positron emitting radiopharmaceuticals are released into the atmosphere. In some cyclotrons a provision of an air trap for holding the air is mentioned. Analysis of possible dose to a member of the public using typical release rates is also presented and shown to be not negligible. A short review of such analysis in literature is carried out to show that the possible internal dose consequences cannot be ruled out and need to be addressed to in the safety analysis of these facilities for regulatory controls. Methods for proper calibration of stack monitors are indicated. In case of location of medical cyclotrons in crowded areas replete with high rise buildings, it may be necessary "to insure engineered safety features to ensure zero discharges from the machines." This overview gives a brief summary on the experimental results on three topics: (1) Thick target neutron yields produced by protons, deuterons, He and heavier ions having wide energy range from MeV to GeV, (2) spallation products production data together with induced activities by proton to U ion and (3) benchmark experiments on neutron shielding using various accelerators of MeV to GeV energies. These three items are essentially important for radiation safety of accelerator facility. Medical cyclotrons are now constructed as turnkey facilities at nuclear medicine clinics, specialised particle therapy facilities and radioisotope production centres. 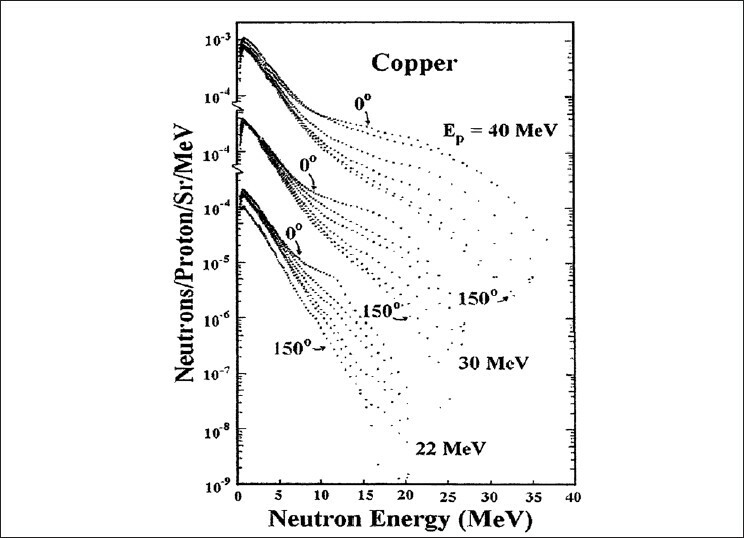 Most medical cyclotrons usually accelerate protons to high energies and could be divided mainly in two categories: (a) Low energy (E P = 15-30 MeV) machines, dedicated for medical positron emission tomography and single photon emission computer tomography radioisotope production and (b) High energy (E P = 100-250 MeV) machines, predominantly used for radiotherapy of malignant tumours. Parasitic gamma and neutron radiation are produced during the operation of medical cyclotrons. 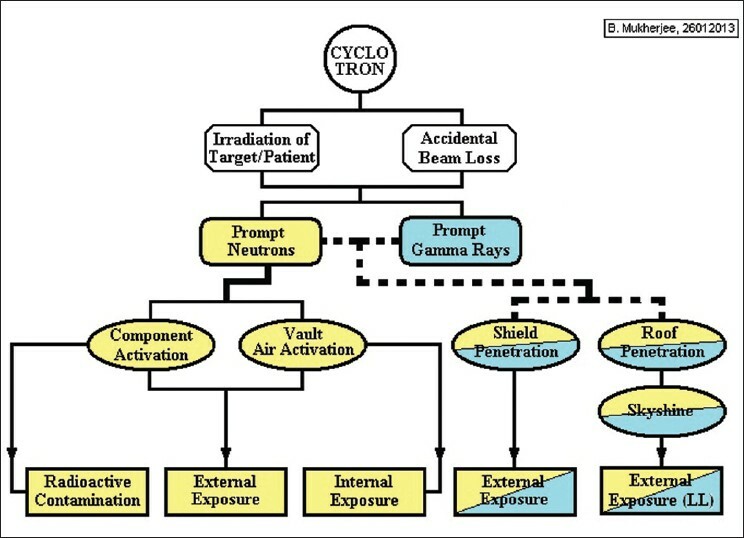 Furthermore, high level of gamma radiation produced by the activated cyclotron components could impose radiation exposure to maintenance crew. Hence, radiation safety is imperative to safe and reliable operation of medical cyclotron facilities. A sound operational health physics procedure assures the minimisation of radiation exposure to patients and members of the public abiding the regulatory guidelines. 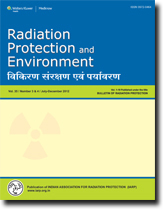 This paper highlights the important radiation safety aspects related to safe operation of proton therapy and radioisotope production medical cyclotrons. 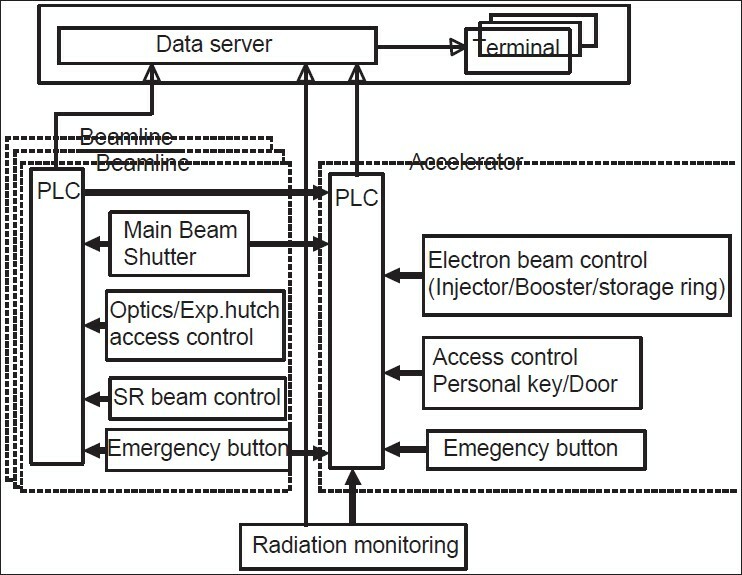 Radiation safety is reviewed for electron accelerators, mainly synchrotron radiation facilities. Accelerator radiation safety systems consist on safety interlock system, radiation shielding and radiation monitoring. These systems depend strongly on the characteristics of machines such as the maximum electron energy. In this paper, conceptual safety systems and radiation sources for synchrotron radiation facilities are overviewed including the evaluation methods of shielding. 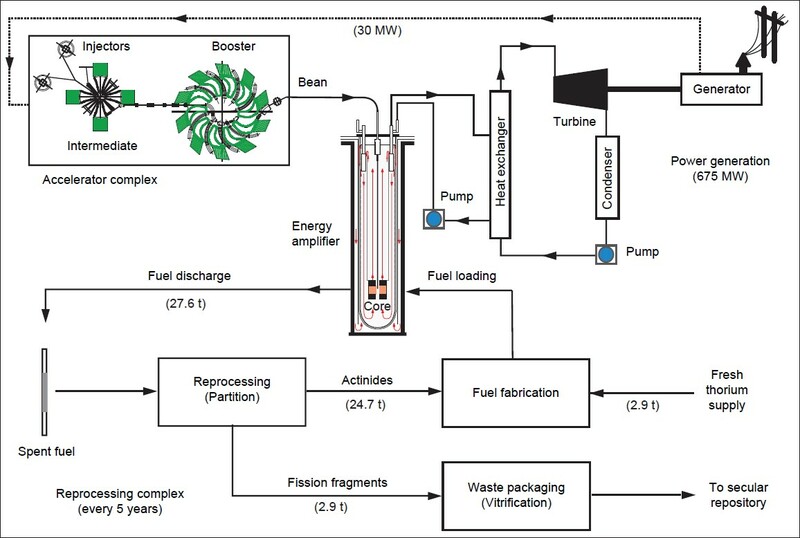 Accelerator driven systems (ADS) have the potential to generate nuclear power by coupling a high energy high current proton accelerator to a sub-critical nuclear reactor. The system has several advantages such as inherent safety from a runaway chain reaction, independence of the reactivity from delayed neutrons, resistance to nuclear proliferation, ability to transmute long lived minor actinides and fission products and, to convert thorium to 233 U. The radiological safety aspects of a typical ADS are discussed in which lead bismuth eutectic (LBE) is the spallation target as well as the coolant. In the irradiated target, residual activity is a major concern, particularly the amount of 210 Po. The time evolution of the major isotopes present in LBE is studied along with the prevailing residual gamma dose rates. Few issues that may surface while coupling a reactor to an accelerator are also discussed. Nuclear reaction models play a very crucial role in theoretical estimation of radiation environment in accelerator facilities where experimental data are scantily available. In this paper, we discuss the exciton and hybrid models for pre-equilibrium reaction, the Weiskopf-Ewing formalism for compound nuclear emissions and quantum molecular dynamics (QMD) model for spallation reactions. 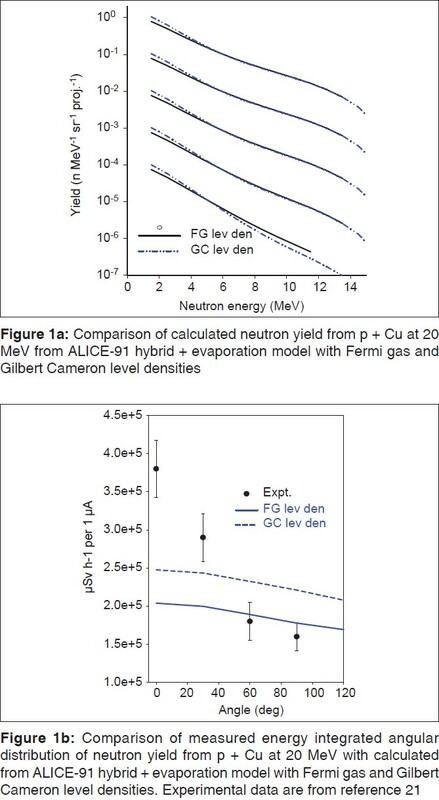 The choice of Fermi gas or Gilbert Cameron level density results in a variation of 21% in the neutron yield from p + Cu reaction at 20 MeV. The surface effects, which are more pronounced at higher energies influence the organ absorbed dose at most to 5% even at 60 MeV for the same reaction. The code EMPIRE and the hybrid model code ALICE give a reasonable estimate of dose and induced activity in proton accelerator facilities up to about 200 MeV until when pion production is not significant. The code HION can be a preferred choice for neutron dose simulation in low energy heavy ion (HI) accelerators. However, the model needs improvement for more accurate estimation of the angular distribution. QMD model can be used to estimate the induced activity and absorbed dose for proton and HI reactions at several hundreds of MeV to GeV per nucleon. The complexity involved in accelerator safety is discussed. Starting with the estimation of the source term the discussion includes design of radiation shield, safety interlock systems. The requirement of probabilistic safety analysis of accelerators and accelerator driven systems with emphasis on human reliability analysis is stressed.